Despite the requirement for me to put my nose to the grindstone of tax preparation, I have spent some time with needles this week <g>. Persistence and procrastination with the mundane led me to extensively on my prayer afghan, the Cabled Afghan from the Lion Brand Site. Despite some un-knitting I am almost finished with it. I decided to meet the commitment to blog writing before completing it and know I will be done before the end of tomorrow. It is as long as I am and should be warm and comfy as wraps the recipient in prayers and love. I also, went to a local yarn shop, Creative Yarns in Macon, 45 minutes north of here for a beginning lace class. This was fun because I actually learned in person to person sphere instead of deciphering you tube videos, books or patterns. Those modes of learning are great, but feedback from an expert in-person really is invaluable. I am glad to find this shop and found the Tammy and Kathy to be personable, warm and caring. 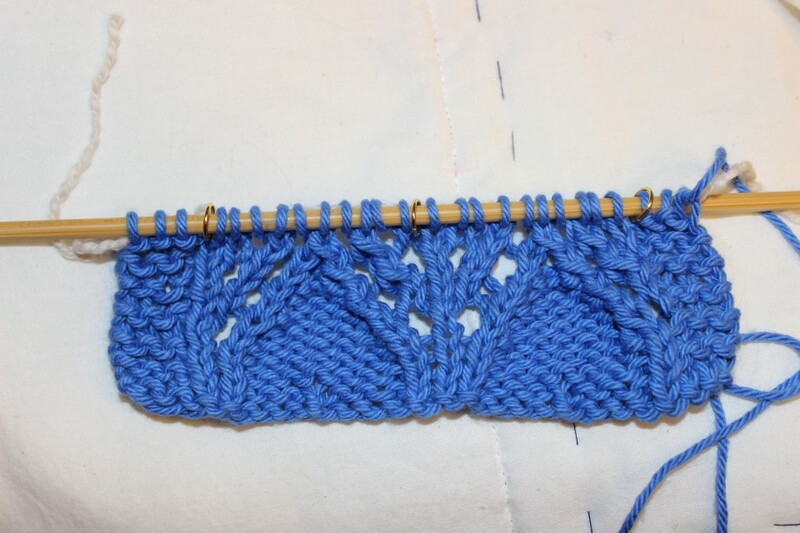 Even though I have knit lace, I was able to pick up several tidbits of information that I will incorporate in improving my knitting. 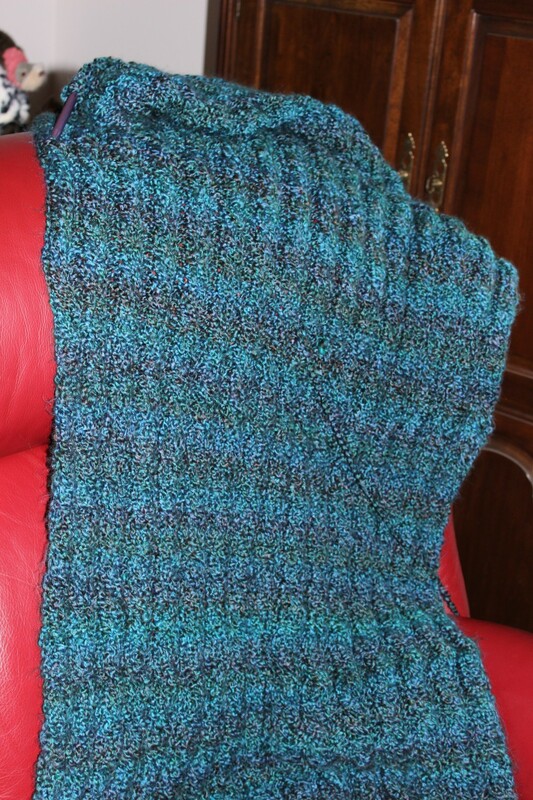 Lace Knitting Class Pattern, One repeat completed in worsted weight cotton on size 7 needles. The other thing that I found is a group of women that if I can bring myself to trek the distance are caring and willing to share. The shop has groups three times a week for open knitting. I am looking forward to improving my knitting techniques. Still to be completed is the Veteran’s quilt, I have worked on it, using stitch-in-the ditch for outlining blocks, I am probably 50 percent complete on this portion. I also, have the Give Thanks Cross Stitch to frame. I am anxious to complete all the filing and tax prep work so I can move on to more fun activities. Unit next week, Needle on! Aside | This entry was posted in Uncategorized and tagged completions., education, knitting. Bookmark the permalink.